Diana and I were having a conversation about bacteria yesterday. She said Louis Pasteur was right concerning his theories on garlic killing bacteria. I asked her how she could be so certian and she told me this very interesting story. When she was taking a biology class the students were asked to bring in a swabbed bacteria sample, Diana swabbed her son’s toilet put the sample in a container and off she went. When she got to class her lab partner had forgotten her sample so they scraped a bit under thelab partners long finger nails and that is what she used in her petrie dish and Diana had her unsavory sample. When they attended the next class they were shocked to find very little had grown in Diana’s dish. Initially, she thought someone had tampered with her sample especially when they saw a small forest growing in her lab partner’s dish. With further discussion the mystery was solved, Diana had used an empty garlic container to store the sample from home to school. You know one of the glass containers that have garlic already cut up ready for use. The professor concluded the garlic was the cause of the sample being partially sterilized. Diana said she had run the bottle and lid through her dishwasher and remembered the smell was still quite pungent when she put the swab in the jar, mystery solved. 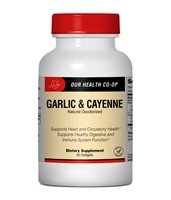 We offer a Garlic and Cayenne product that is very popular with our members, now I know without a doubt why. I loved the story and knew I should share. Thanks Diana!